The abundance of different marijuana strains is impressive, to say the least. Contrary to a popular belief, weed isn’t just weed. If you’ve ever browsed through different marijuana strains at your dispensary, you’ve probably noticed that they’re categorized into four different types. Indica, Sativa, and hybrid– does it ring a bell? Oh, we almost forgot… There’s also Cannabis ruderalis. If you plan on being a cannabis consumer, it’s paramount that you understand the difference between these species. While most marijuana strains will get you high, the sensation, as well as the palette of health benefits, will be different depending on which kind you consume. Below we explain the differences between various kinds of marijuana. Before we get to that, let’s jump right into the vortex and elaborate on the origins of the plant. Marijuana and hemp are one of the oldest agricultural crops on earth. Marijuana has been used for medical and recreational purposes for over a millennium. Some of the greatest civilizations have been drawing upon the medical and spiritual benefits of marijuana for over 12,000 years, including China, India, and Egypt. Marijuana has a long record of cultivation in Europe and America as well. In the modern history of the United States, Cannabis indica and Cannabis sativa have been known since the 18th century. It wasn’t until the federal prohibition took its toll on the plant in the 1970s when the War on Drugs started. After 4 decades of being stigmatized, marijuana is now going through a renaissance as scientists discover more and more of its medical benefits. The plant has a chance to regain its once well-revered reputation once again. Now, let’s proceed to compare the different kinds of marijuana available today. Biologists first started classifying marijuana a long time ago. The first record of marijuana classification dates back to the late 18th century when French biologist Jean-Baptiste Lamarck observed some of cannabis plants had an intoxicating effect, unlike their hemp counterparts. Lamarck later named the plants Cannabis Indica to distinguish between cannabis of Indian origin from plants cultivated in Europe. In total there are 3 different species of marijuana. On top of these three species, we can have hybrids, combining two or more different species together. It’s these hybrid options that make cannabis so diverse. There are literally thousands of different kinds of cannabis thanks to hybridization and selective breeding practices. We’ll map out the most striking differences between indica and sativa plants, to begin with. Further, we’re going to elaborate on hybrid strains and Cannabis ruderalis to make the classification as simple as possible. Cannabis sativa is believed to have originated in India, and it typically thrives in hotter parts of the globe with a climate similar to India, such as Columbia, Mexico, and some African countries. Marijuana breeders claim that places located under the 30 degrees north latitude line offer the best conditions to grow sativa plants. Cannabis indica, on the other hand, likes colder climates at higher mountain elevations. This variety of the marijuana plant originated from countries like Nepal, Pakistan, Lebanon, Afghanistan, and Turkestan. Indica plants typically thrive north of the 30-degree latitude line. Sativa strains are best suited for outdoor cultivation, as they tend to grow very tall, reaching up to 15 feet in height, blooming with plenty of upward-pointing branches. Since the plants grow so high and aren’t that dense, the sun can easily reach all the buds to give you great yields. Speaking of which, sativa typically flowers in 60-90 days, so you might have to wait a while until it’s ready for the harvest. The final result will be ripe and abundant, though, so it’s totally worth it. When it comes to indica strains, these species are quite a bit different than its cousin sativa. Indica plants can grow up only to 6 feet tall; while they may lack those extra feet, they are certainly bulkier than cannabis sativa, providing dense and resinous buds and an extremely strong aroma. Indica typically flowers in 45-50 days; this is much faster than the sativa, but the shorter flowering period can compromise the quantity of yields. Given their short height and fairly easy cultivation process, indica are best suited for indoor growing. When choosing between marijuana strains in a dispensary, budtenders will most likely ask you whether you prefer indica or sativa. That’s because most consumers use this basic classification as a touchstone for predicting effects. Sativa strains tend to produce more stimulating, uplifting cerebral effects that stir creativity and are great for social gatherings, physical activity, and creative jobs. Thus, they’re recommended for daytime use to keep a person focused on their tasks while making them more enjoyable. The effects of indica varieties are at the opposite end of the spectrum. Indica plants are physically sedating in general. They induce full-body relaxation and stave off stress, making a person calm and, sometimes, even sleepy. This is why cannabis consumers use indica strains as a herbal nightcap before bed. However, according to an expert in the cannabinoid field, Dr. Ethan Russo, the clinical effects of marijuana have nothing to do whether the plant is short and dense vs. tall and thin, or whether the leaves are compact or broad. The effects of marijuana strains are rather cannabinoid-dependant. Simply put, the ratio of THC to CBD determines whether you will feel energized, uplifted, and focused, or end up hungry, sedated, and body melted. Marijuana Hybrids: What Are They? 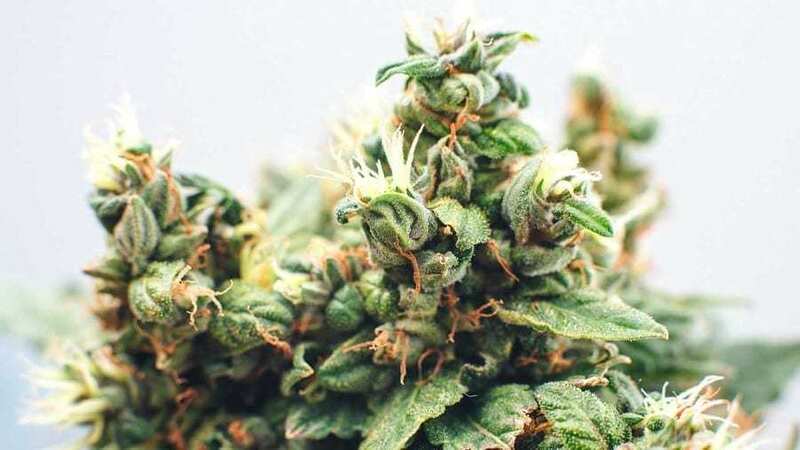 Marijuana hybrids offer the best of both worlds. Many of the strains you’ll see in your dispensary are hybrids, a crossbreeding of both indica and sativa strains. Let’s operate on living examples. Consuming an indica-dominant hybrid will allow you to experience the majority of its indica features with some distinct notes of sativa – and vice versa. 50/50 hybrids, on the other hand, will be your best bet if you’re looking for strains you could use throughout the day regardless of the time. Let’s get a bit beyond the traditional classification. There’s also the third cannabis species called Cannabis ruderalis; however, it’s not the most popular variety. Originating from Northernmost parts of the world (e.g. Russia), cannabis ruderalis grows extremely short, reaching up to 20-25 inches, with a denser foliage structure similar to indica. This variety is usually not psychoactive, but it produces an autoflower effect, which is why cannabis ruderalis is bred with other cannabis species to produce unique strains. The benefit of this species is that unlike sativa or indica, it will flower after a certain period of time, no matter what. The other species require a change in daylight hours to initiate flowering. As the season gets closer to winter, and the days get shorter, the plant will begin to prepare for winter by sending out flowers and eventually, seeds. The problem with this is that it takes a lot more logistics and planning when growing, especially in places where the fall season is too short to allow the buds to fully develop before the frost hits. Autoflowers are predictable in when they’re going to flower, and you can plan around this much more easily, especially if just starting out. For this reason, ruderalis offers some unique horticultural benefits that can be combined with the strength, or flavor qualities of other cannabis species. Simply put, Cannabis ruderalis has little to no commercial use, but it’s a great additional source of genetic material to provide specific breeds. Which Type of Weed Will Be Best For Me? Most cannabis aficionados prefer one type of weed over the other. Some people can’t imagine a day without a sativa, while others will only smoke an indica to unwind after a long day or take a nap to recharge their batteries. If you’re wondering what type of weed will be best for you, it all boils down to what you’re using it for. Do you want to get creative and boost your energy levels? If motivation is your buzzword, then add a sativa (or sativa-dominant hybrid) to your next shopping list. Can’t put up with racing thoughts before falling asleep? Does your appetite need some serious stimulation? If you answered ‘yes’ to one of the above, an indica (or indica-dominant hybrid) will be your best bet. The easiest way to find out which weed will be best for you is to buy a gram of each strain and test it out. How to Recognize Different Types of Marijuana? Putting the different species aside, there is also plenty of different forms marijuana can come in. The potency of marijuana, as well as the range of effects, can vary significantly from one form to another. Also known as pot or green, weed is the unprocessed form of marijuana which typically comes in the form of dried and cured flowers. High-quality weed will be bulky and well-trimmed, with a generous layer of frosty trichomes containing cannabinoids and terpenes. One of the most distinctive features of weed is the aroma. The smell is pungent and very intense, both in its fresh state and while being smoked. Once you know the smell of weed, you will be able to tell right away if someone has just smoked it simply by feeling the third-hand smoke from their breath or clothes. Regular marijuana smokers might be unaware of it, but the odor is quite obvious to most people. Learning to recognize the aroma of weed can help you determine whether you’re in the company of a marijuana user, which might be a good indicator that you’ll be offered some weed to smoke in a second. Hash, short for hashish, is a marijuana concentrate sourced from the resin of the Cannabis sativa or Cannabis indica plant. This resin is dried and packed into blocks of hashish using a special press. Hash is often warmed, crumbled, and added to a joint or spliff, but many people like to smoke it in the old school way using a pipe, bong, or chillum. Depending on the specific type of hash, its color may range from dark brown or almost black, through different shades of brown, to a dirty yellow-green color. Although all types of hash are formed into blocks, their texture may be different, too. Some hash products are shiny while others are matte or dull. The texture of hash also varies from quite moist (like modeling clay) to dry and hard (like soap). Like weed, hash has a very distinctive aroma. It’s often mistaken for marijuana if a person doesn’t see it directly. Cannabis oils are made by extracting the active constituents of the cannabis plant into an oil. This oil is then taken orally or held under the tongue for faster effects. Oils are useful because they make cannabis consumption simple, and easy to dose with standardized dosing. Cannabis oils come in all forms, including psychoactive, THC-containing versions, and non-psychoactive, hemp-made oils. You can also find oils in all strengths, from low potency (300mg/ounce) to high potency (4000 mg/ounce). For some people, flowers and hash are not enough. If you’re one of those people looking for extra strength in cannabis, concentrates will be your best bet. Marijuana concentrates are extracted from the plant with a solvent or supercritical CO2 extraction to achieve the highest potency. They usually contain between 65% and 85% THC, but some highly concentrated products can reach even 99%. Concentrates are available in the form of wax, crumble, oil, or crystals; they determine the consistency of your concentrate, although the majority of concentrates share an amber-gold color, so it’s easy to tell the difference between dry buds and, say, shatter. The best part is that you only need a small amount of this stuff to produce the desired effects. Marijuana can also be consumed orally and hash oil is not the only way to take it. In fact, you can cook many delicious foods with marijuana. This cannabis-infused food is commonly called edibles. A classic way to eat weed is to bake marijuana brownies or cookies, but you may very well add it to any dish that contains fat, such as mac & cheese and different sauces. Better yet, marijuana may even appear in a candy. While you may not be able to tell if the food smells like weed (other ingredients will mask the smell), you will know you’ve just eaten one if the high kicks in within about an hour after consumption. Also, the effects of edible forms of marijuana can be quite potent and longer-lasting. Marijuana plants can be categorized into three main species: Cannabis sativa, Cannabis Indica, and Cannabis Ruderalis. If you’re looking for the psychoactive effects of marijuana, Cannabis ruderalis shouldn’t be of your interest, as this variety is mostly used to breed new marijuana strains. Whether you choose sativa or indica will depend on how you want to benefit from marijuana, but if you can’t make up your mind, hybrids should come in handy. You can choose between indica-dominant, sativa-dominant, or 50/50 hybrids, all of which produce different effects on the body and mind depending on their parent strains. Because of the diversity brought on by hybridization (mixing species together), there are literally thousands of different kinds of marijuana. Marijuana also comes in different forms, including the 5 most popular ones: weed, hashish, oils, concentrates, and edibles. Knowing the difference between various marijuana strains and consumption methods is paramount for personalizing your experience with the herb. The potency, cannabinoid content, THC/CBD ratio, terpenes; they all impact on the effects of marijuana. We hope this guide has helped you figure out which type of weed will be best for you.